The Vancouver Condo Buzz » Landmark Burnaby Condo Tower > TRIOMPHE Brentwood Condos for Sale with Awesome Amenities! Landmark Burnaby Condo Tower > TRIOMPHE Brentwood Condos for Sale with Awesome Amenities! COMING SOON TO BRENTWOOD BURNABY! A residential masterpiece is coming soon to the most exciting neighbourhood in Burnaby! Called Triomphe Brentwood condos, this new tower is located in a dynamic urban enclave that is connected to everything. With a WalkScore of 77, Bike Score of 91 and Transit Score of 78, you are right in the middle of all the action! The Burnaby Triomphe condos in Brentwood are just a short 3 minute walk to Willingdon Heights Park, 5 minute drive to Hastings Sunrise neighbourhood, 1 minute drive to Vancouver, 3 minute walk to Gilmore SkyTrain Station, seven minute walk to Whole Foods, 15 minute drive to downtown Vancouver and a nine minute walk to Brentwood Mall! In addition, live close to shopping including: Shoppers, Winners, Save-On-Foods, Home Depot, Costco and to recreational activities such as Steve Nash Fitness Centre, Gold’s Gym, Oxygen Fitness, bike and walking trails, Willingdon Heights Park and Burnaby Lake. Eateries and restaurants around the new Burnaby Triomphe Brentwood condo tower includes Starbucks, Tim Hortons, Boston Pizza, The Keg, Sushi Garden, Brown’s Social House, Cactus Club and Joey Burnaby. The presale Burnaby Triomphe condos in Brentwood are a glory to behold. The Triomphe tower features a strong contemporary silhouette with staggered lighting that adds a dynamic visual appearance. Dramatic tapered entry columns create a sense of arrival, and the beautifully paved motor court with terraced gardens is reminiscent of an upscale hotel. The tower is built to LEED sustainable standards and features 1 to 3 bedroom floor plans. The iconic architecture of the Triomphe Burnaby condos is by Chris Dikeakos Architects. The high-rise will utilize solid concrete construction and feature secured underground parking (parking stall comes with every suite purchase) in addition to car charging station and four electric cars provided). For more information about the new Triomphe Burnaby condos, please visit www.triompheresidences.com or you can simply register your interest on the top of the blog page for all the latest updates. 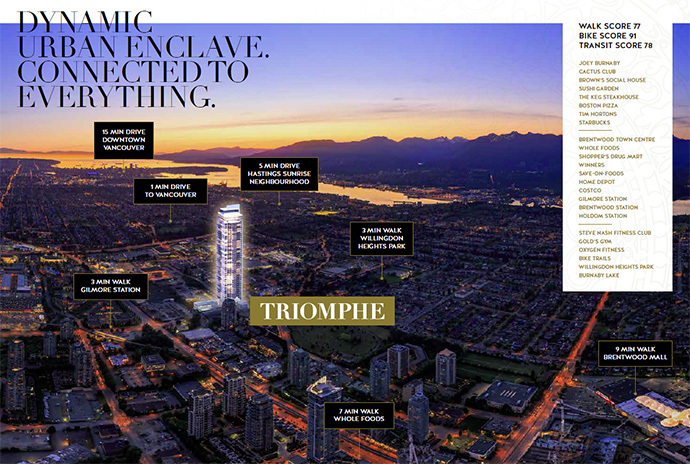 Triomphe is poised to set a new benchmark for luxury in North Burnaby real estate market and there is an incredible level of excitement surrounding this new project. Located at Gilmore and Halifax, the new high-rise concrete tower by quality luxury developer Millennium Development Group will offer air conditioning in every suite, 9 foot ceiling heights in all homes and the Burnaby Triomphe penthouses will have 10’6” high ceilings! The interior design is by award winning Mitchell Freeland design group and there is a plethora of units to choose from that are highly efficient and investor friendly designed homes. All of the homes at the new Triomphe Burnaby condos have expansive balconies up to 378 square feet and all residences come with premium finishes with high end Bosch appliance package. 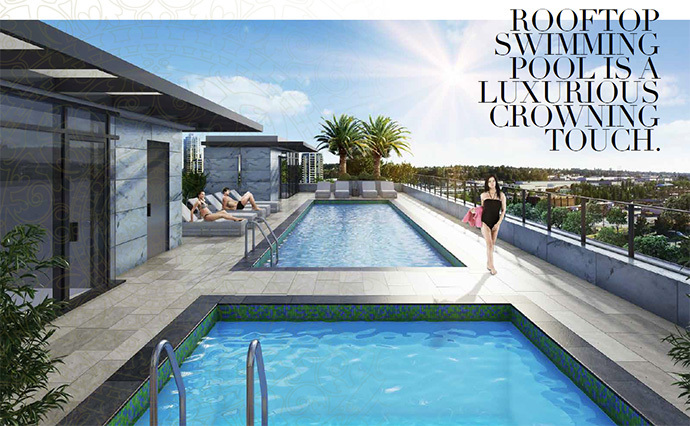 Residents will have exclusive use of the Club Triomphe that has a three storey amenity pavilion with rooftop pool! Upon entering the grand 40’ high lobby adorned by travertine marble, bronze and French style furnishings, you’ll feel compelled to take a moment and full absorb the magnificence of the space. High speed elevators with floor restricted access and a concierge at your service will enhance security and peace of mind. The 3 storey Club Triomphe at the new Brentwood Triomphe condo tower will feature a music/games room, business centre/library, full equipped kitchen, social lounge with big screen television, BBQ area and fire pit outside. As well, there is a fully equipped fitness centre, yoga/dance studio, separate steam rooms for men and women in addition to an outdoor rooftop pool, hot tub and lounge space. The Triomphe floor plans range from 1 bedroom/1 bathroom units (from 460 square feet approximately) to 2 bedroom plus den/sleep (from 857 square feet approximately). There are also 2 bed/2 bath Triomphe floorplans that range from 690 sqft approximately. Please stay tuned for more details as they are released. There are two colour schemes carefully selected and designed by Mitchell Freedland Design that includes Clair (light) and Fonce (dark). Spacious open floor plans are designed for entertaining and easy living and all homes have 9 foot ceilings in the main living spaces and up to 10’6” in penthouse suites at Triomphe Burnaby. The living areas have laminate wood floors and all homes have air conditioning. Expansive balconies create a seamless connection between indoor and outdoor living and all homes have Blomberg front loading washer and dryer. The stylish bathrooms will feature polished quartz stone counters and modern above counter vessel sink. The Triomphe condos in Brentwood Burnaby will also feature a European style vanity with soft close hardware, floating mirror with medicine cabinetry, large format porcelain floor tiles and tub/shower surround and Grohe chrome fixtures. 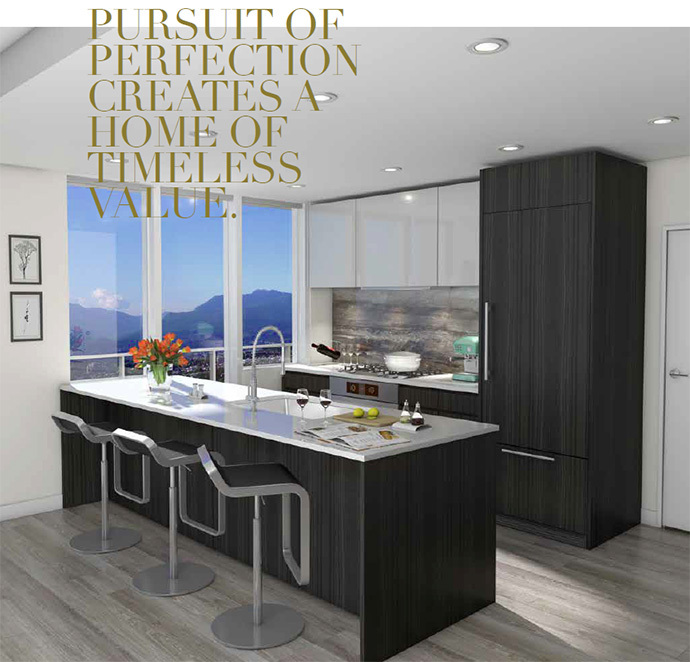 The inspiring kitchens at the presale Burnaby Triomphe condos will feature polished white quartz counters, two toned soft close cabinetry and white lacquer finish upper cabinets. The Triomphe Brentwood condos also feature Riobel chrome faucet and a high performance appliance package that includes the following: stainless steel four burner Bosch gas cooktop, integrated stainless steel Bosch wall oven, integrate Bosh fridge/freezer, glide out Bosch hood fan and stainless steel Panasonic microwave.